The functionality of Cas9 is determined in part by the guide RNA with which it is associated. Norwak et al. (2016) review briefly how guide RNAs can be modified to enhance their function and to functionalize them in novel ways. Canonical small guide RNA showing a 20 nucleotide spacer region followed by a series of loops and hairpins. Norwak et al. briefly describe the general structure of Cas9 and various orthologs isolated from various species that have been shown to be useful for genome editing. The most popular of these is from Streptococcus pyogenes but Cas9s with some utility have been isolated from Staphlococuccus auresus, Streptococcus thermophiles, and Neisseria meningitides. Cas9 endonucleases can be programmed to interact with specific DNA sequence addresses using a single guide RNA – sgRNA. sgRNAs have a canonical structure that includes, beginning at the 5’ end of the molecule, the spacer sequence that will interact with the target DNA, followed by a series of stem-loop structures that play various roles in interacting with Cas9. There are a variety of ways by which sgRNAs can be produced – transcription using Pol III promoters, Pol II promoters and in vitro transcription. While transcribing sgRNAs is one thing, getting them into their final form is quite another and Norwak et al. describe the various ‘tricks’ that can be used to have the primary sgRNA transcript ‘processed’ into a functional form. These tricks include the inclusion flanking ribozymes, Cys4 endoribonuclease sites and tRNA sequences. This is an example of a modified sgRNA containing 3 RNA hairpin aptamers that bind uniquely labeled RNA binding proteins. This an example of functionalizing an sgRNA so it can be used for localization studies. This is part of the CRISPRainbow system described initially by Ma H, Tu LC, Naseri A, Huisman M, Zhang S, Grunwald D, Pederson T. Nat Biotechnol. 2016 Apr 18. doi: 10.1038/nbt.3526. This image is borrowed from Addgene where the CRISPRainbow system can be obtained. The figures in this short review are clear and informative and are an excellent complement to the text. 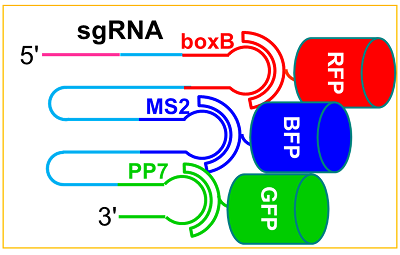 The main topic of this article is the sequence modifications that can be made to sgRNAs that result in interesting and important changes in the functioning of sgRNAs. For example, if the spacer is shortened from 20 nucleotides to 17 or 18 there is a reduction in off-target cleavages. In mammalian cells where this effect has been quantified, the reduction in off-target cleavages was by several orders of magnitude. Further reduction in the length of the spacer to 15 nucleotides results in the elimination of cleavage activity but the Cas9/sgRNA complex still retains its target sequence specific binding activity. This section of Norwak et al. describing the various sgRNA modification is particular interesting and thought provoking and anyone working with Cas9 would be advised to seriously consider exploring their options for designing sgRNAs. Reducing off-target activity, increasing sgRNA stability are just a few of the things that can be altered and these alterations would seem to be to the advantage of most investigators. Finally, Norwak et al. review how sgRNAs can be functionalized by incorporating RNA structures that recruit other proteins that have various activities. For example, the hairpin structures normally found at the 3’ end of sgRNAs are not absolutely essential for activity of the sgRNA and can be replaced with specifc RNA hairpin structures that acts as aptamers for, for example, the coat protein of the bacteriophage MS2 (MCP). By functionalizing MCP with transcription activators or epigenetic writers and erasers, or fluorescent proteins one can use the sgRNA along with Cas9 to create novel genome editors, regulators and markers. It seems clear after reading Norwak et al. that the canonical sgRNA should not be the first choice for efficient genome editing and interested readers are encouraged to take a close look at this review and the relevant primary literature cited in it.